How to Update KYC Details EPF UAN Account Online? How to Update KYC Details to UAN EPF Account Through Online? EPFO (Employees Provident Fund Organization) had made it mandatory to link Aadhar number to the Employees Provident Fund Account. EPFO had made facility of online service to make all its service easier and faster. By updating the KYC details to the EPF UAN account one can access all the facilities which are provided by the EPFO through its official online portal. But you can access all those facility by updating your account with the KYC details. 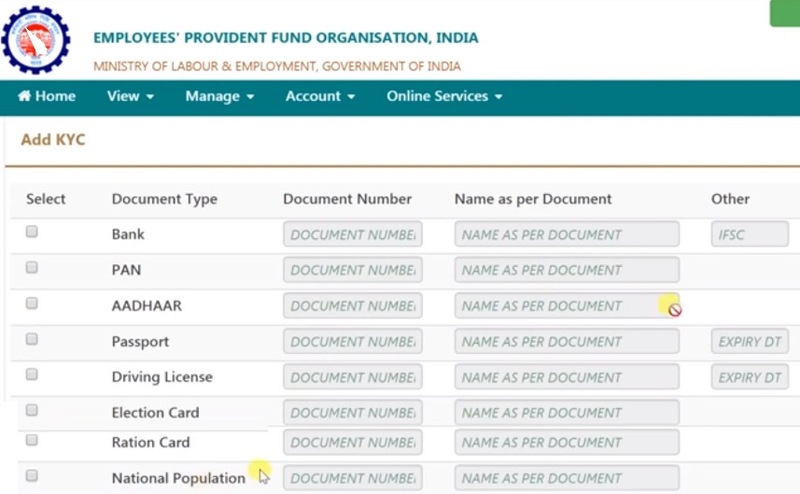 One can update their KYC (Know Your Customer) details for EPF online through the UAN EPFO online portal. To update your KYC details you have to login into your EPF UAN account first o all you have to enter into your UAN account for that one must contain the activated UAN number. Then how to update the KYC details to the EPF account through online? What are the benefits of updating the EPF UAN account with the KYC details? And what are the documents required while updating the KYC details? In this we provide you the information about how to update the KYC details to the EPF account through online, benefits of updating the KYC details and the documents required updating the KYC details. The below are the details about the benefits, documents required and how to update the EPF account. The below are the documents which are required to update the KYC information through online for the EPF account. The below are the benefits which are provided by the EPFO to the employee by updating the KYC details successfully to their EPF UAN accounts. By updating the KYC details to determine the true identity of the account and beneficial ownership of the account. You can check your EPF account details through online by using the EPFO official online portal. You can submit the online PF transfer claims or make the partial/full withdraw of money from your PF account through online. If bank account details are not updated successfully your withdraw claim maybe rejected. If the EPF account is not updated with the KYC details, the EPF member will not get any SMS alert if KYC documents are not submitted. These are the benefits of updating the KYC details with the EPF UAN account. The below are the steps to follow to update the KYC details to the UAN EPF account through online. After login into the UAN account select the Manage option in that from the drop down menu choose for the KYC option. Next Add KYC option will appear on the screen under that you have to enter the PAN card, Bank account details and Aadhar number. After updating the details it will show the status of KYC is still pending until the details are approved by the employer. Once your employer approves the details, then you are moved to the “approved section”. After updating the aadhar number to the UAN number the status is shown as approved. But it will l again have to be cross check by the EPFO with the database of UIDAI. Once aadhar card number is cross checked then the status below the aadhar number shows verified. Next the status is shown verified then only your UAN get linked with the aadhar number successful or else it will show you an error message. By this you can link your aadhar card to the EPF UAN account through online. 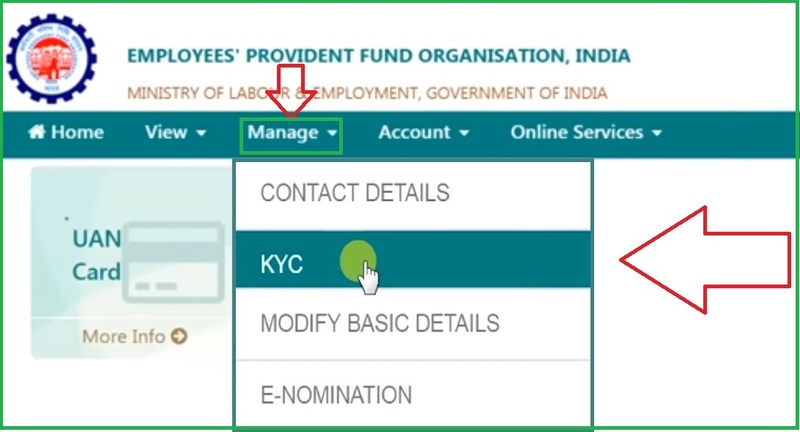 After the successful updating of the KYC details you can check your PF account balance, UAN funds transfer and all the online facilities provided by the EPFO.